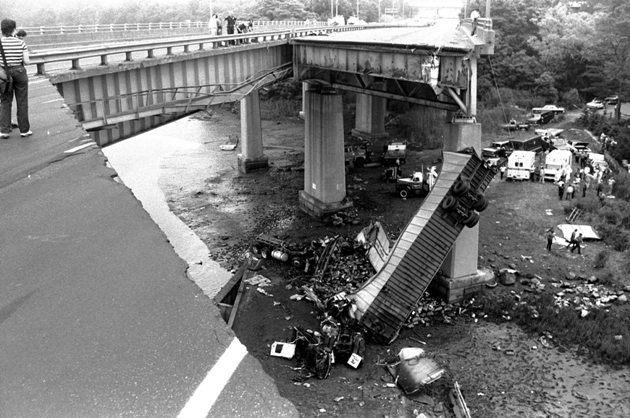 Not long after midnight on June 28, 1983, a section of the Mianus River Bridge on I-95 in Cos Cob collapsed. Within seconds, two tractor-trailer trucks and two passenger cars plunged into the river. Three people were killed and three injured. A Connecticut state trooper, the first official to arrive at the accident scene, praised the cooperation of the agencies. Stamford and Greenwich Marine Police and the Coast Guard were called; Greenwich firefighters and the Cos Cob firehouse ambulance responded; Greenwich police blocked off the turnpike; the National Guard came with helicopters. Ordinary citizens stepped forward that night. Everyone worked at a feverish pace to save lives and minimize the extent of the disaster. One unnamed hero, a man journeying home to Atlanta with his wife, had, upon spotting the collapse, exited his car and waved traffic to a stop. His quick action likely prevented more vehicles from plunging off the bridge. After the event and until repairs could be implemented, the 80,000 to 90,000 vehicles that used I-95 on a daily basis were diverted to local streets. Greenwich police were stretched to the limit as they tried to keep the traffic moving and pedestrians safe. The Special Police Division donated over 750 hours in July and August to help. The Department of Health of the Town of Greenwich monitored the environmental impact closely, providing advice and counsel through the issuance of special bulletins to residents along the temporary routes. The town passed a resolution allowing the First Selectman to sign applications and agreements to obtain federal funds to defray the costs resulting from the bridge collapse.